It's not a Start Square week, but I just put this tutorial together for my Lovely Linen Bee group, so I thought I would share it all with you too! finished size: 8.5" x between 40" and 83"
1. 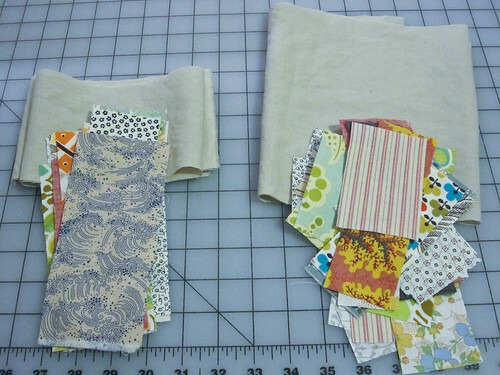 Take your background fabric (8" x 42") and cut it in half so that you have 2 pieces that are 8" x 21" (3 total). 2. 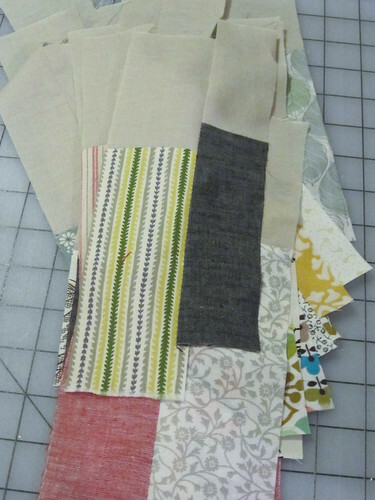 Take one of the 8" x 21" pieces and cut it in half so that you now have 2 pieces that are 4" x 21"
* We are going to be working with 2 sets: tall color pieces (that use the linen from step 2) and short color pieces (that use the linen from step 1). 3. Look at your fabrics. You may want to set some aside to be tall and take others to be shorter pieces (cut them as you see fit). I started with pieces between 1.5"-3" wide and 4"-7" tall. 4. 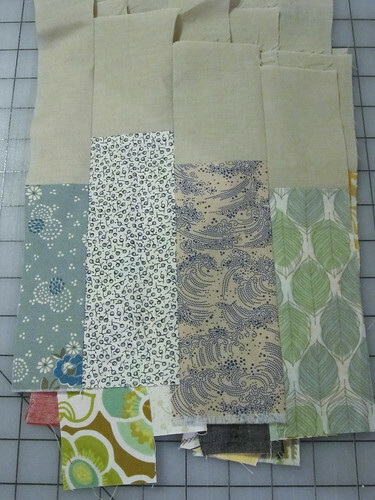 Take the shorter pieces (under 6" tall) and sew them to the 8" linen in a string piecing method (see picture). It's best if your pieces are touching, but not overlapping. 5. 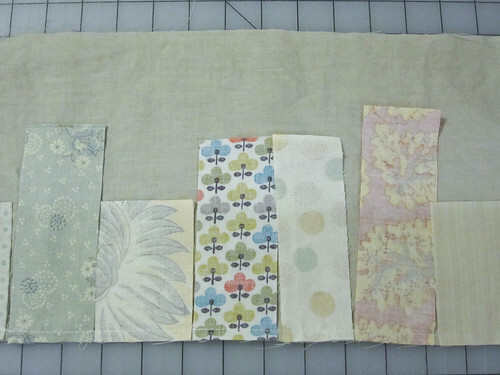 Repeat with your taller pieces (6" or more) and the 4" tall linen. 6. Press seams toward cotton. 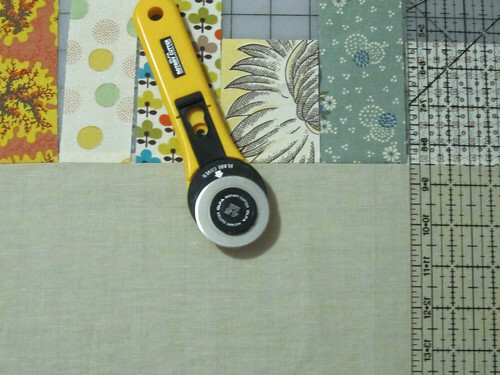 Use your rotary cutter & ruler to trim them apart. 9. Once you have about 8 pieces sewn together (about 18" wide) you're going to trim it to 8.5" tall. It's easier to trim now than at the end. 10. Sew together these trimmed blocks, this time making sure that the top & bottom are aligned. 11. Repeat until you have a row! Or until you are burned out! :) I made it to about 50" wide in just over an hour (with documentation). I am very happy with how this is looking! 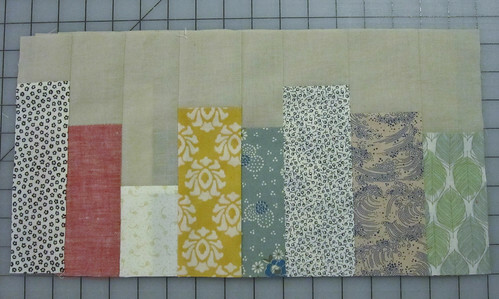 I made a collage in Photoshop, but I'm not going to share it because I want to final quilt to be a surprise! Hi Alexandra, it looks fantastic. I love it! Can't wait to see the finished quilt. Very nice! I'm about to go out of town for 8 days. Will be looking forward to working on it when I get back. I think this will go really quickly. I really like it! I love this. I might need to try one! http://www.flickr.com/photos/25806308@N00/6693426013/in/photostream/ Look, Ali! I'm making progress on mine! I've seen the bookshelf block before using the salvage of whatever fabric names you want for the book title. Cute.